Javi Gracia’s Watford have now beaten Palace three times this season, having done the double over them in the Premier League. Javi Gracia prepared for Saturday’s quarter-final by resting seven players for their league game at Manchester City last weekend. While it may have cost them their best chance of upsetting City at the Etihad, Gracia’s decision proved fruitful with the Spaniard and his team now having an FA Cup semi-final at Wembley to prepare for. Deulofeu, who netted against City, was their main threat throughout, his livewire running and trickery a constant thorn in the Eagles’ side. Watford’s intensity dropped in the second half and they were made to pay when Batshuayi levelled on the hour mark. But after that they regained control and Gray netted their winner shortly after coming on – finishing with aplomb after Pereyra had found him in space in the middle of the box. “It’s sensational. I couldn’t ask for more,” Gomes told BBC Match of the Day. “It was amazing today – it was emotional to be honest. Saturday’s game marked only Palace’s second FA Cup quarter-final in the past 24 years. And while they did have recent good form for beating Watford in the FA Cup – claiming victory in the 2016 semi-final between the sides – they did not do enough to progress at Vicarage Road. Gomes was forced into a good diving save by Max Meyer early in the second half, before the Brazilian easily dealt with Andros Townsend’s swerving free-kick. But the former Tottenham keeper was unable to prevent Palace’s leveller, as Batshuayi finished coolly after catching Mariappa in possession. However, Palace were unable to build on their equaliser to recreate their heroics of 2016, or avenge their two defeats by Watford this season, as Gray’s 79th-minute winner sent them home with nothing. Manager Roy Hodgson will be particularly disappointed – he has now lost three FA Cup quarter-finals – and at 71 years of age this may have been his last chance of success in this competition. The Eagles were weakened by losing Wilfried Zaha to an hamstring injury he picked up in last weekend’s defeat by Brighton, but Hodgson is optimistic the forward will return to full fitness in time for their Premier League match against Huddersfield after the international break. “We were unlucky to lose a player of Zaha’s quality before the game,” Hodgson said. “We don’t really want to go into an important quarter-final without players of his ability and his importance. So that was a bit unfortunate as, of course, has been the Mamadou Sakho injury. 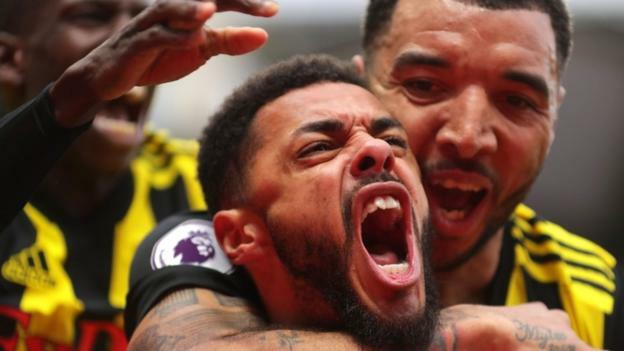 Watford manager Javi Gracia, speaking to BBC Match of the Day: “It is amazing for all of us, for the players, staff and supporters. “It is an important day to have the chance to enjoy a semi-final, we are keeping the same level, competing well and that it is our target in this moment. Crystal Palace boss Roy Hodgson on BBC Match of the Day: “It was a close game, once again a game at this stage of the season affected by conditions – the wind was difficult, and you can’t get the ball down on the ground as much. At half-time there wasn’t much to say – they had a lot of corners and used the wind to their advantage. Three of Etienne Capoue’s four goals for Watford this season have been in cup competitions, including two in the FA Cup.